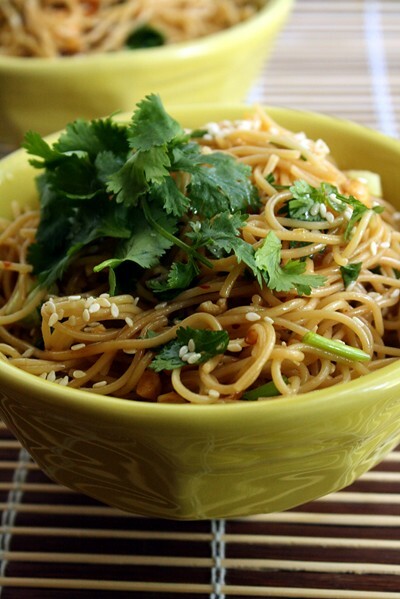 Spicy peanut noodles are my go-to recipe when I need to bring a dish to share at a potluck or cookout or some other gathering that involves people coming together with food. Except when I bring dessert. Which is pretty much always because I do not go to a whole lot of get-togethers that do not involve people I know quite well, and those people expect me to bring dessert. At least I think they do. Maybe next time I will bring these noodles and find out if they like me for who I am or are using me for my cookies. A few years ago, my sister and I threw our parents a surprise party to celebrate their 40th wedding anniversary. 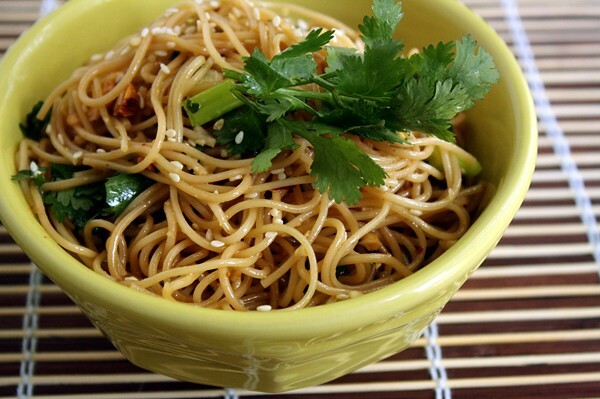 Our family friend Bert introduced the party goers to these noodles, and I have loved them ever since. They give my other party favorite, Sweet & Crunchy Slaw, a run for their money. 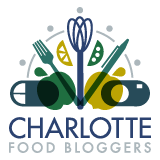 More recently, I brought this dish to a potluck picnic with a new group of people: the Charlotte food bloggers. I was nervous curious about what they would think, and I am happy to report the noodles were a hit. Enjoy! Bring the pasta to a boil in a pot of salted water. While the pasta cooks, stir together the oil and red pepper flakes in a saucepan over medium heat. Allow the red pepper to infuse the oil for about two minutes. Stir in the honey, soy sauce and salt until dissolved, then set this dressing aside. Once the pasta is cooked and drained, place it in a bowl and add the dressing. Stir or toss to combine, then cover and refrigerate at least four hours, preferably overnight. 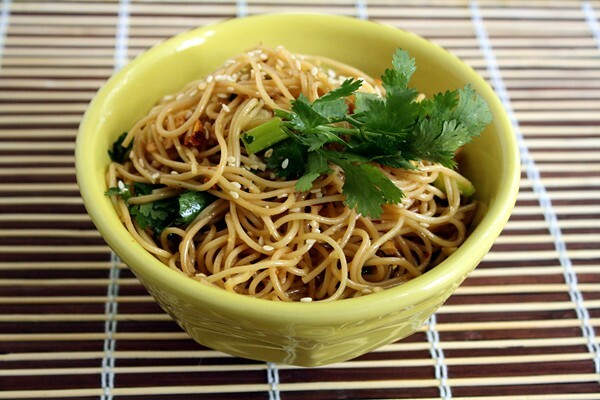 Immediately before serving, stir in the cilantro, peanuts and green onion. 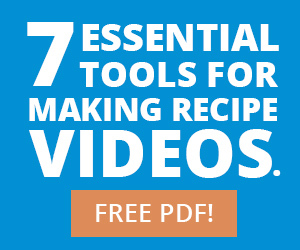 This recipe is easily doubled to use a full 16 oz. box of noodles. The cilantro, peanut and green onion measurements are not set in stone, so feel free to add more or less depending on your preferences. Tried this recipe last night and it is absolutely delicious. I will be making this again and again.